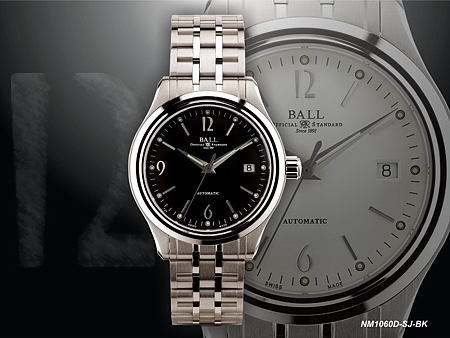 Introducing the Trainmaster Streamliner, the latest from BALL Watch. This classic timepiece features a vintage BALL-inspired dial with deco Arabic markers. 14 micro gas tubes light up the dial and hands for night readability. The movement features an automatic caliber ETA 2824 with hours, minutes, seconds and date function. Satin and high polish finishes highlight this 39mm stainless steel case with a screwed-in crown and anti-reflective sapphire crystal. Available with a sharp black or white dial and with a stainless steel bracelet or a crocodile strap.